The main features of Fifteen Magic are given below. Two foreign language translation of this page are available ‒ Belarussian by Dussk Translations and Estonian by Johanne Teerink. 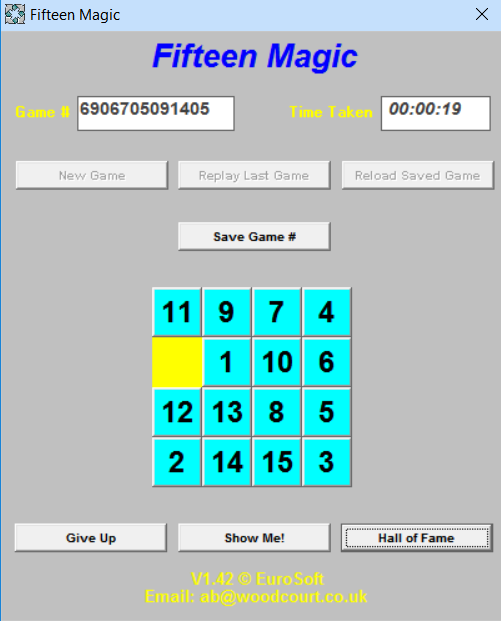 Fifteen Magic is a Windows based implementation of the classic Fifteen Puzzle dating back to the 1800's. When the "New Game" command button is left clicked, the 15 numbered squares are randomly shuffled and the objective is to restore the 4x4 grid to its original state. Left clicking any square horizontally or vertically adjacent to the empty yellow square causes it to move to that empty square. The challenge is to figure out a series of such moves to achieve the desired objective. As soon as the squares have been randomly shuffled by left clicking the "New Game" button, a timer is made visible to show the time it is taking to solve the puzzle. The "top ten" times are retained in the "Hall of Fame" and you will be invited to input your name if your time is sufficiently good. At any time you may quit the game being played by left clicking the "Give Up" button and you may also inspect the entries in the Hall of Fame by left clicking the "Hall of Fame" button. There is a "Show Me!" button which you may left-click to obtain the program's recommended next move. Left clicking this button repeatedly will solve the game for you. As soon as the "Show Me!" button is used, the timer is turned off for obvious reasons. You may also alternate between making moves yourself and using the "Show Me!" button. In theory, 10461394943999 starting positions may be generated. Each starting position, or permutation, is identified by a "Game #" shown in the Game # text box on the main screen. Interesting or challenging starting positions may be "saved" by storing the corresponding Game # via the "Save Game #" command button, and reloaded at a later time via the "Reload Saved Game" command button. During a session the last game played, whether successfully or unsuccessfully, may also be replayed using the "Replay Last Game" command button.